The Type 41 75 mm mountain gun is a Japanese license-built copy of the Krupp M.08 mountain gun. The Type 41 number was designated for the year the gun was accepted, the 41st year of Emperor Meiji's reign, 1898 in the Gregorian calendar. Originally it was the standard pack artillery weapon. 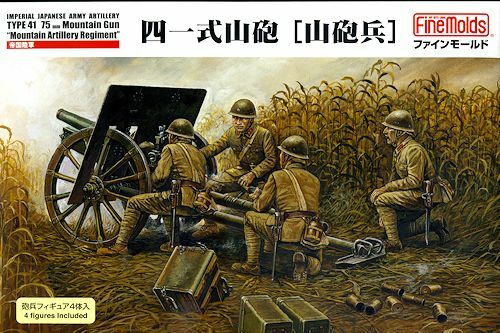 After it was superseded by the Type 94 75 mm mountain gun, it was then used as an infantry "regimental" gun, deployed 4 to each infantry regiment, and referred to as "Rentai Ho" (regimental artillery). Two gun shields were produced for the weapon, an early type, which folded into thirds, and a late type, which folded in half. In Japanese service the gun was crewed by thirteen men, twelve gunners and a squad leader. When the weapon was being fired there would be one aimer, one loader, one firer, one person to swing the guns aim left or right, a man inserting the fuzes into rounds and handing them to the loader, two gunners lying in reserve to the left and right of the gun position, and the squad leader sitting a little distance to the rear of the weapon. The remaining five men would ferry ammunition in relays from the ammunition squad, which would typically be in cover a few hundred meters behind the gun's position. The weapon could be transported complete by its thirteen man squad, or broken down into parts and carried on six pack horses using special harnesses, a seventh horse was used to carry ammunition. Two types of impact fuze were available for the Type 97 75 mm High Explosive round, one with a delay of 0.05 seconds, the second with a delay of 1 second. U.S. Army testing of the weapon at a range of 3,200 yards resulted in 75 percent of the rounds falling in a rectangle 20 by 30 yards. At maximum range (7,800 yards) 75 percent of the rounds fell within a rectangle 10 yards wide and 200 yards long. This is one of those kits that looks a bit lost in a standard size box. The total of four sprues is neatly molded without any issues in terms of molding glitches that I could see. You could fit four kits easily in the box, though. Half of the sprues are dedicated to the figures. One of them is for the main figures themselves while the other looks to be a generic IJA sprue with helmets, guns, packs and the such. There will be quite a few spares from this sprue. Though the Wiki article mentions a crew of 13, for this kit you get the squad leader, bunner, aimer and a man with a shell. The decal sheet that comes with the kit (not shown) is mostly for crew uniforms. The other two sprues are dedicated to the gun itself. This is apparently an early version as it has a three piece gun shield. The gun barrel is in two pieces and has a nicely detailed breech block and cradle assembly. The frame for the gun looks decidedly old fashioned, as it should for a gun designed in the last years of the 19th century. However, the Japanese had no need for anything much newer as it worked well enough for what they confronted in the 30's and first years of the 40's. The gun can be elevated and moved in azimuth. There are seats on the frame for the loader and the aimer. The kit also comes with ammo boxes as well as empty cartridges and ones ready to be used. 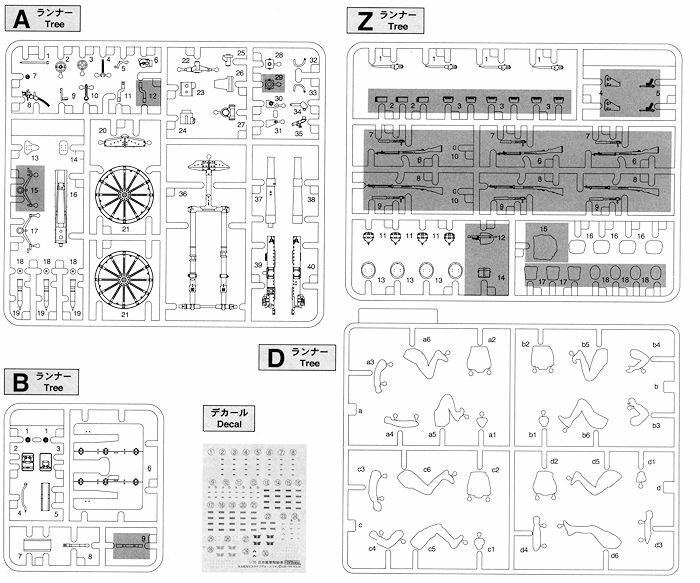 Instructions are very well done, right down to showing that you need to remove the sprue gate pips from each piece. Full color and markings guide is provided with the gun in IJA Khaki with steel rims on the wheels. To my knowledge, this is the first IJA field gun kit done for WWII and earlier fans. It will make a very nice addition to any collection and I'm quite pleased that Fine Molds has decided to continue doing this sort of thing. Thanks to www.dragonmodelsusa.com for the preview kit. Get this at your local retailer or have them order it for you.